Post note: I received messages from two experienced birders who said they believed this bird had either worn off one wing bar or was young and had not acquired it yet. 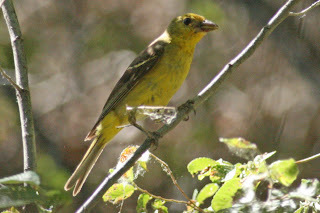 I saw this apparent female Western Tanager this morning on the Canon City Riverwalk, but something didn't seem right so I took these pics. The first thing that struck me was that this bird had only 1 wing bar instead of the two that are considered field marks for separating female Westerns from other female tanagers. The pics seem to show a yellowish wing bar and it is in the location of the greater coverts. The yellowish wing bar that would be expected to be formed by the tips of the median coverts is not present (photos show some spots of daylight that were filtering through the branches). 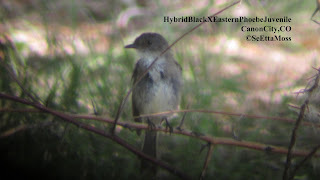 While watching for the Black, Eastern and hybrid offspring Phoebes I have been following in Canon City,CO I spotted a second hybrid juvenile. 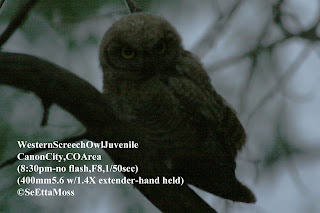 It was easy to tell that this was another juvenile as it's appearance is substantially different from the first hybrid juvenile. The top and middle pics are of the second hybrid juvenile while the third is one of the pics I took of the first hybrid juvenile I found a week ago.